Geomembranes can fail for a variety of reasons. In order to help you keep your geomembrane performing to the best of its ability, you will find an outline of three common geomembrane failure mechanisms below. When a geomembrane reaches a construction site, it has the potential to be punctured by a variety of sources like birds, plants, or animals that peck, protrude, and scratch geomembrane liners. Although wildlife-caused punctures not as common as the other types, it is still a problem. Typically, the damage from animals and plants takes a few years to culminate, but once it does, leaks and cracking can occur within your geomembrane liner. When installing a geomembrane liner it is important to be mindful with your construction equipment. When machinery, or 100 lb. sand tubes, are moving across the top of the liner, they can pull at the protective top coat, removing it. Angular rocks are also a common cause of geomembrane punctures. Whether the geomembrane liner needs angular rocks for slowing down water currents or for cooling down chemicals or other liquids, it is a best practice to install a geotextile between the rocks and your geomembrane. This will offer some puncture protection. Be sure to contact the geomembrane manufacturer for recommendations regarding the kind of geotextile you should be using, or whether a geotextile is needed for that project in the first place. ASTM D883 defines ESC as “an external or internal crack in a plastic caused by tensile stresses less than its short-term mechanical strength.” ESC is most commonly, if not exclusively, seen with HDPE geomembranes. When ESC occurs, the crack will cause a chain reaction, propagating through the liner, seriously compromising the liner’s integrity. To help reduce the likelihood of ESC, it is best to keep uniform, unreinforced geomembranes, such as HDPE, buried and not exposed to the sun’s UV rays. Wicking occurs when the coating separates from the base fabric or yarns in the reinforced geomembrane. This can also happen in unreinforced geomembranes when the layer of the uniform material starts to peel away from itself. This phenomenon can jeopardize the overall integrity of the geomembrane. Be sure to double check with your geomembrane manufacturer to avoid specifying a geomembrane that might be more likely to experience wicking for your application, if it happens at all. Some geomembranes are prone to wicking, while others are anti-wick. If wicking does prove to be an issue, contact your manufacturer for guidance. Always talk with a variety of geomembrane manufacturers before specifying or purchasing material. They will help you find the right geomembrane material for your application. 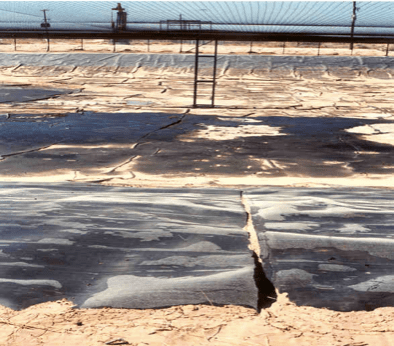 What type of geomembrane failures have you come across? Tell us about it in the comments!